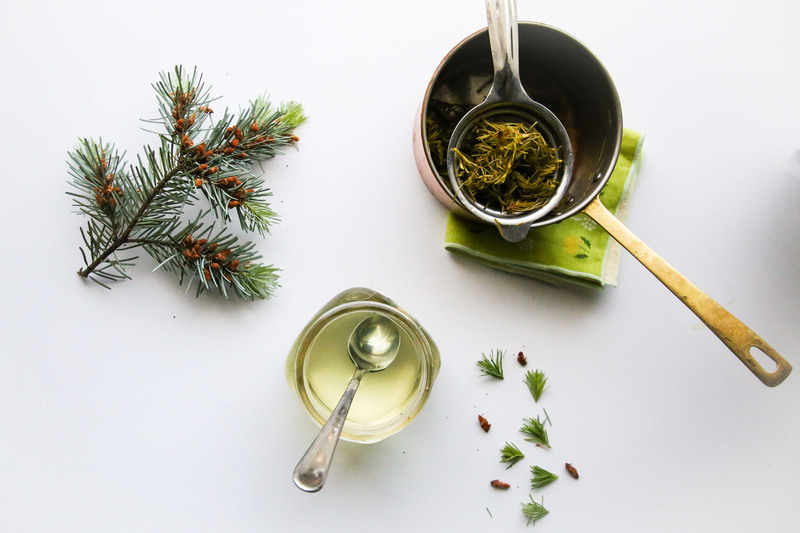 Spruce tip syrup OR how to invoke spring time when you need it the most! This is my first gatherer posts so please oblige me as I take you on this tiny adventure. We have four spruce trees hanging out all over the backyard and I have a pretty good relationship with them. They give us shade, a place for birds to nest (hence a lot of relaxing tunes in the morning) and loads of pine cones to clean up. The only time I dislike a conifer is during a windstorm and this whole will it-won’t it game I play in my head doesn’t justify chopping them down. Never! I’ve lived in the house for four years now and this year was the first time I plucked a spruce tip to smell it. Why? I don’t know. I just made an association that if the trees had nice smelling bark then they must have something in the needles too. It’s hard to believe that nobody told me exactly how AMAZING they really are. I’ve heard about almost every Pacific northwest weed and herb since I moved here. But the one thing in abundance that truly *smells* like spring – nobody tells me about. I’m sure Native people across Washington are laughing at me (and ALL OF YOU) right now. Spruce tips are in season in Washington right now and if you’re as excited as I am, we can be weird together. The are easy to identify. The colour of the bud is much lighter than the rest of the branch. You just have to pluck them ever-so-gently and put them in a jar. Rub one or two between your palms. Instant aromatherapy. 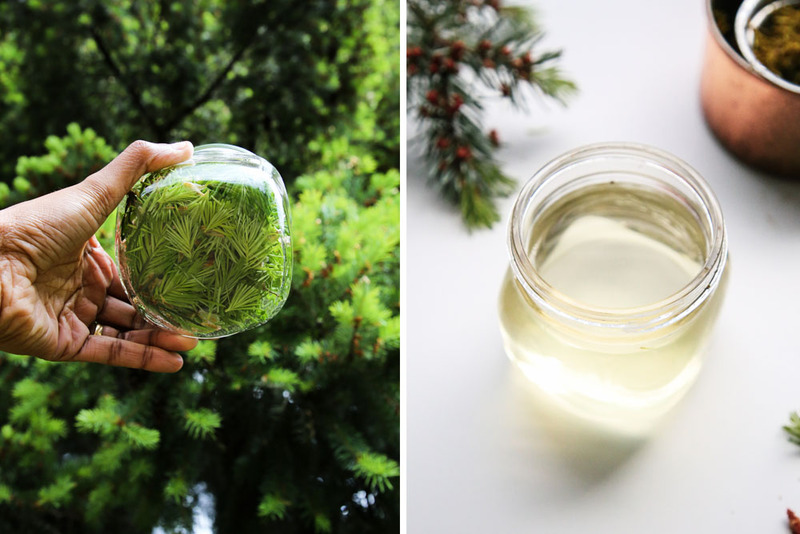 Here is a wonderful post about harvesting spruce tips by Kelsey Breseman, who is part-Tlingit, a native tribe from Southeast Alaska. And here is more information and a similar recipe by Hank Shaw from Honest Food. Why isn’t it in all the salads? The possibilities are endless. 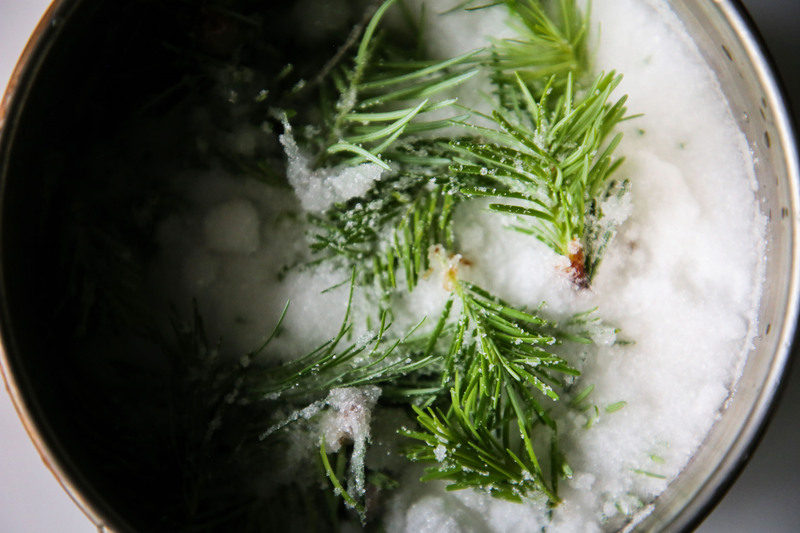 If you want to scent sugar, wash the spruce tips, dry them thoroughly and them put them in a jar with sugar to infuse. The next day (or for however long you want it to infuse), sift the sugar through a sieve and use in cookies. I made a syrup out of it for drinks because it feels like it would be great with mint and berries in sparkling water in the summer. What do you think? Please let me know if you try it this weekend! It’s totally okay if your syrup is not the thick consistency of say, maple syrup. It is still good and you will still be able to use it in whatever drink you please. As always, please be careful while foraging and consuming plants that you are not familiar with. Place all the ingredients into a pot and put it on medium heat. Stir the pot to allow the sugar to dissolve. Bring the mixture to a boil and as soon as it starts to bubble, turn down the heat and simmer for a minute before taking it off the stove. Cover the pot and let it steep as it cools. You can also leave it in the fridge to infuse overnight for a stronger flavour. Line a strainer with cheesecloth and strain the syrup into a jar once it has completely cooled. Store in the refrigerator and use liberally. Sounds good Edlyn! We have a spruce in our backyard – but the branches are too high up to reach. I too love the smell of spruce – the bark, the resin, etc. Unfortunately we had to chop down a huge one in our front yard as it was diseased and not at all suitable for the yard – it was probably over 35 years old. Luckily we had it cut down as when Austin had to dig around to put in some patio stones, some of the roots salvaged were thicker than a man’s thigh, The crew that did our driveway last summer also excavated huge roots that had distorted our driveway! How’s the rest of your garden doing? One batch of my peonies are in full bloom as they get the sun all day. I’m waiting for the three other bushes to bloom. I just picked some lettuce leaves of a new variety that we planted this year – red Romaine. Our tomatoes and chillies are flowering and we even have one chillie.